Archives : MARKET SET FOR NEW HIGHS, AGAIN - 14/08/2014. MARKET SET FOR NEW HIGHS, AGAIN – 14/08/2014. Once again the correction was short-lived and shallow. This has been the story of the market in the past three months, as the Nifty continued its journey between 7500 and 7800. Every small dip is being bought into and this time was no different as the Nifty rebounded from a low of 7540. Nifty is just 50 points shy of lifetime high levels and it won’t come as a surprise if the Nifty once again makes a new high. This time the rally is concentrated in only a few frontline stocks and the broader market is seen lagging behind, which is not a very encouraging sign. The broader market needs to catch up with the Nifty or else the market might just give up on all the gains. Negative Divergence is spotted every time the indices register new highs, which is a definite sign of concern. Sensex opened the week at 25476, made a high of 26135, low of 25437 and closed the week at 26103. Thus it closed the week with a gain of 774 points. At the same time the Nifty opened the week at 7619, made a high of 7796, low of 7598 and closed the week at 7791. Thus the Nifty closed the week with a gain of 223 points. On Monday, the market formed a Bullish Tri-Star formation. In this case, there are three neutral candlestick formations instead of the doji formation. On the weekly chart a Closing white body Marubuzo has been formed whereas the daily chart has seen a formation of white body candle which is fourth in succession. Thus candlestick formations suggest a bullish bias in the near term. Also both the indices completed a Bullish Island Reversal and thereby generating a Buy signal. The signal will stand negated if the Sensex closes below 25232 and Nifty below 7540. Since the formation is occurring in a consolidation phase, one cannot attach higher significance to it. The market is constantly making higher top higher bottom formations and thus continues to remain in an uptrend. In the short term, the trend is likely to reverse if the Nifty closes below 7540 and Sensex below 25232. A breach of this support is likely to test the Support zone between Sensex 24979-24878 and Nifty 7441-7394 is due to a confluence of the 61.8% correction level with intermittent bottoms at Sensex 24892 & 24878 and Nifty 7441 & 7422. This week, both Sensex and Nifty managed to reclaim the short term average of 20dma (Sensex – 25827 and Nifty 7712) as well as the medium term average of 50dma (Sensex – 25568 and Nifty – 7638). Both the indices continue to remain well above the long term average of 200dma (Sensex – 22620 and Nifty – 6743). Thus the trend in the short term and medium term has once again turned positive while that in the long term continues to remain bullish. MACD continues in Sell mode despite being in positive territory. Meanwhile Price ROC has just turned positive and hence has given a Buy signal. RSI (58) is above the equilibrium line and hence indicates bullish momentum. Stochastic Oscillator %K (70) continues in Buy mode as it remains above %D. ADX remains at 23, which suggests the strength of uptrend has reduced. The Directional Indicators have given a Buy signal this week as +DI has gone above -DI. OBV has started moving higher but is yet to signal a Buy. Interestingly both RSI and MACD have confirmed negative divergence of the second order. Thus Oscillators are suggesting consolidation in the near term. Option writing for the current month series suggests support coming in at 7600 and resistance at 8000. 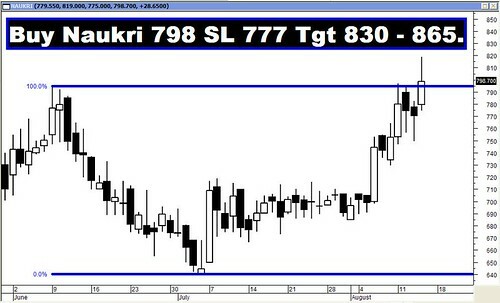 Friday saw strong Call writing at 7900 strike and Put writing at 7700 strike, which indicates immediate resistance at 7900 and immediate support at 7700. Strong Trendline Support for the Sensex is at 25440. Trendline Resistance for the Sensex is at 26416. Strong Trendline Support for the Nifty is at 7573. Trendline Resistance for the Nifty is at 7876.